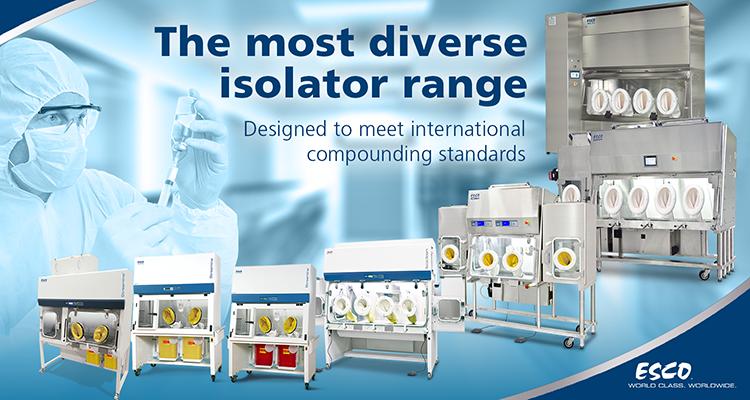 Esco Pharma is pleased to launch our latest range of isolators specifically engineered to meet the growing demands of pharmacy compounding industry. Esco currently has the most diverse range of standard isolators for every single application and budget requirement. Esco has been designing and manufacturing systems of world-class quality for almost 40 years. Our company is the first to launch cGMP-compliant isolators into the pharmacy compounding industry in the Europe, making Esco a proven market leader in clean air technology. Our isolators* for pharmacy compounding exceeds the demands of compounding facilities and are compliant with EU cGMP and PIC/s standards. Initially engineered for the pharmaceutical industry, these isolators are now used in pharmacy compounding applications, following the trend of stricter guidelines and practices. Bag-In-Bag-Out and Low Contamination filter changes in isolators ensures operator and environment protection during a filter change.